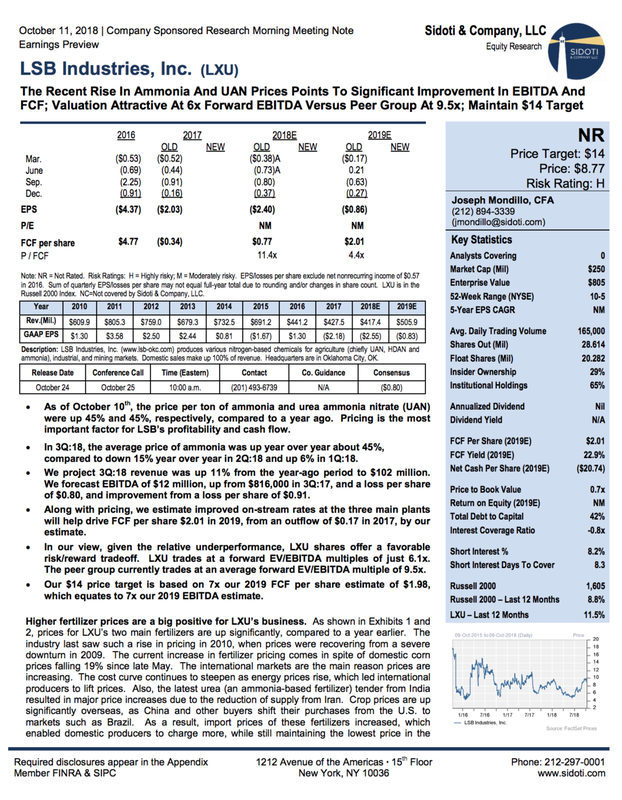 Equity research on LSB Industries (LSB) produced by Sidoti as part of its Company Sponsored Research program. LSB Industries, Inc. manufactures and sells chemical products for the agricultural, mining, and industrial markets in the United States and internationally. The company provides nitrogen-based fertilizers, such as ammonia, fertilizer grade ammonium nitrate (AN), urea ammonia nitrate, and AN ammonia solution for agricultural applications; high purity and commercial grade ammonia, high purity AN, sulfuric acids, mixed nitrating acids, carbon dioxide, and diesel exhaust fluids, as well as concentrated, blended, and regular nitric acids for industrial applications; and industrial grade AN and solutions for the mining industry. It offers industrial acids and other chemical products to the polyurethane, paper, fiber, emission control, and electronic industries; and blended and regular nitric acids, and industrial and high purity ammonia for various specialty applications, including the reduction of air emissions from power plants, as well as agricultural products to farmers, ranchers, fertilizer dealers, and distributors. The company also sells industrial machinery and related components; and holds working interests in natural gas properties. LSB Industries, Inc. was founded in 1968 and is headquartered in Oklahoma City, Oklahoma.